Intimidated by that giant ham? 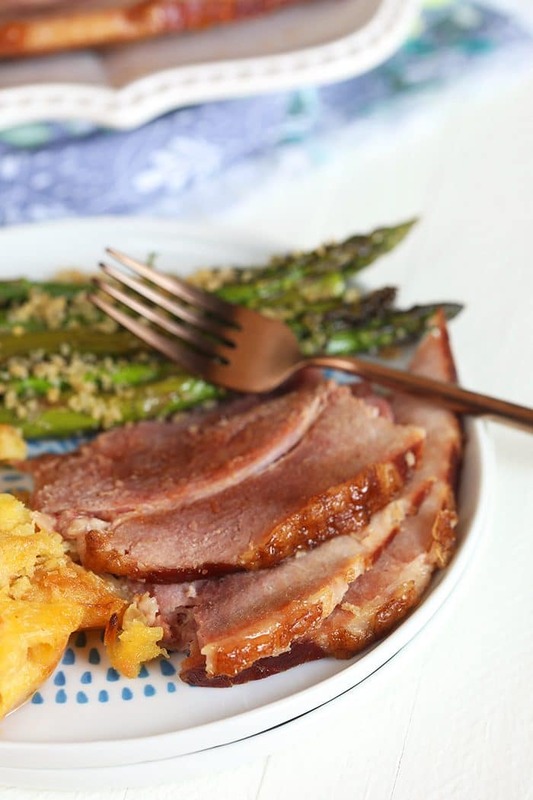 This Crock Pot Ham with Pineapple Brown Sugar Glaze is the recipe for you! 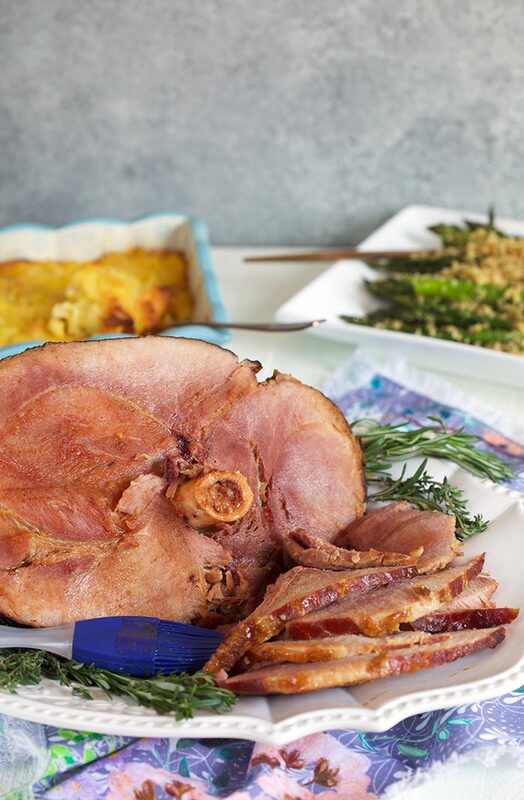 So simple to make, this Slow Cooker Ham recipe can be made with a whole ham or your favorite spiral ham! Holidays just wouldn’t be the same without a big bone-in ham as the centerpiece of the buffet table. While Thanksgiving requires a big, golden turkey…Christmas and, most definitely, Easter MUST have a ham. 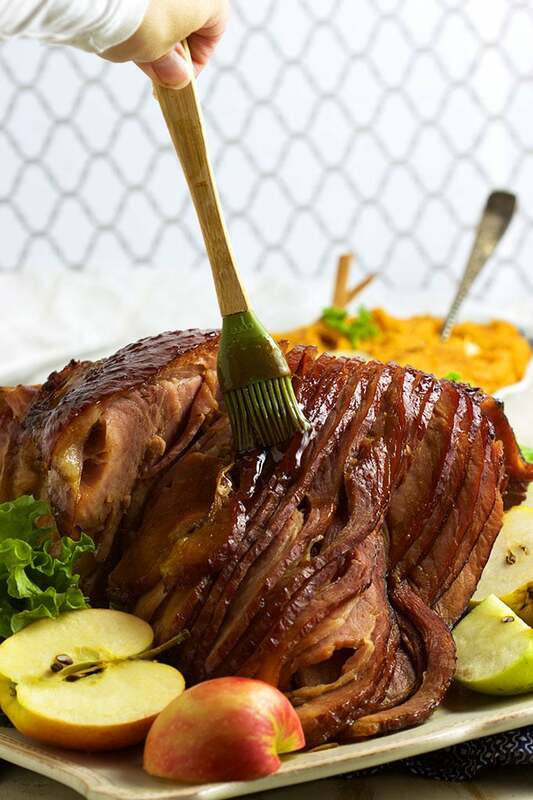 I look forward to Easter the most because our Easter ham is consistently sweet, salty, tender and juicy. It’s my favorite part of Easter dinner….besides the potato pierogi.…and the kielbasa…..and the fried cabbage. Ok, well, maybe it’s not my MOST favorite part but I definitely don’t ever skimp on the ham. Sometimes that ham can seem challenging….I remember the first one I ever made I was so totally intimidated by how to cook a ham. 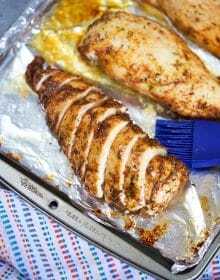 It seemed like such a daunting task and I expected the prep work to take HOURS….but once I cooked my very first spiral ham all by myself, I knew this was going to become even easier moving forward. 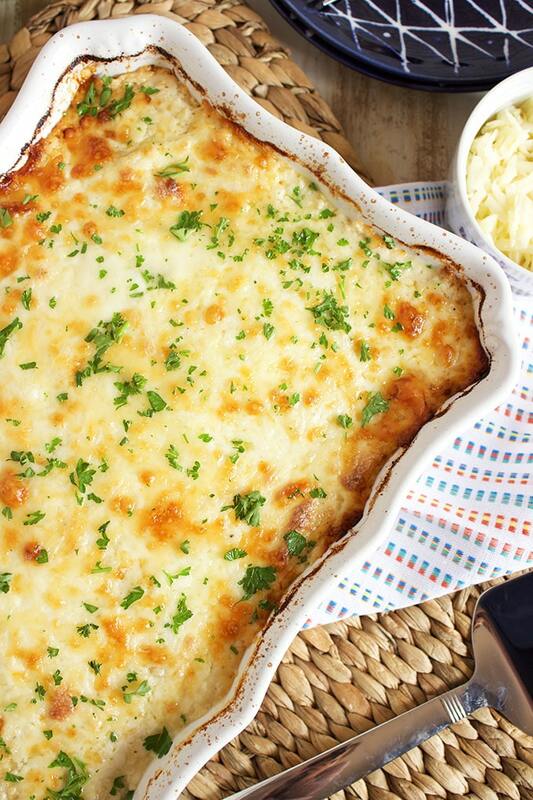 We sometimes find space is an issue when hosting holiday parties….specifically, space in the oven. So, I decided it was time to enlist the help of my handy slow cooker and created this amazing Crock Pot Ham recipe with Pineapple Brown Sugar Ham Glaze! Well, it was more of a put the ham in the slow cooker and then pour the glaze over the ham situation….than a creation. But it worked beautifully, leaving us with the most tender, juicy glazed ham we have ever stuck a fork into. What kind of ham should you buy? 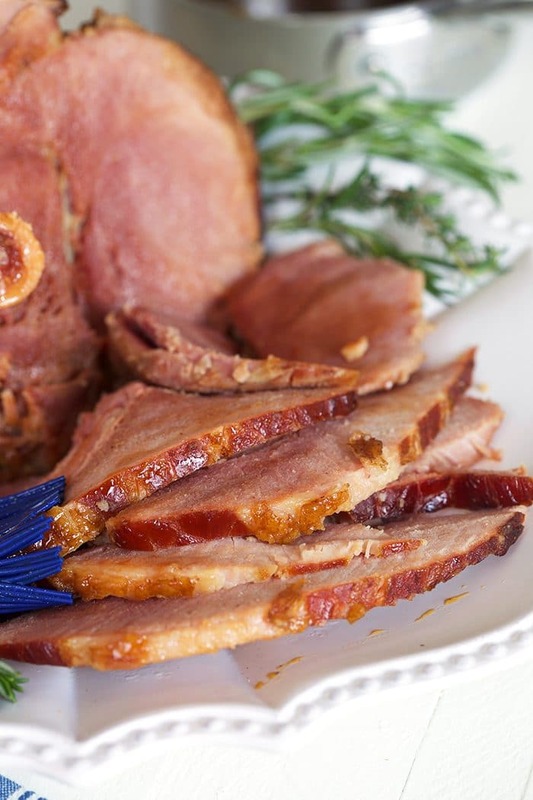 There are so many different types of ham in the market these days but for this easy Crock Pot Ham recipe I like to use either a bone-in cured half ham or a cured spiral sliced ham. 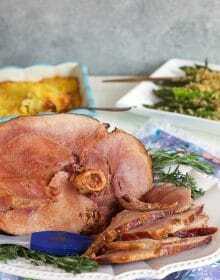 You could also use a boneless ham but it will only need to cook for about half the time indicated in the recipe. Also, I like to pick a ham that weighs no more than 8 pounds because you may have trouble fitting it into the slow cooker if it’s any larger than that. 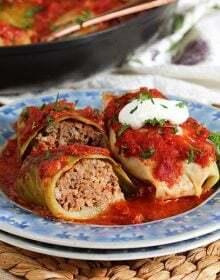 I used an 8 quart oval Crock Pot to make this recipe. A round crock pot or slow cooker will only fit a smaller boneless ham, just a few thoughts to keep in mind when you run to the store to pick out that ham. 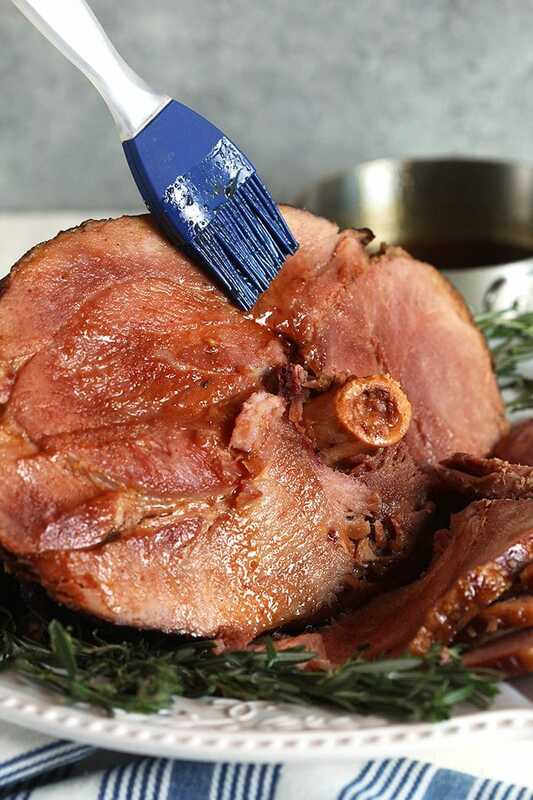 Unwrap your whole bone-in ham or spiral ham and pat dry with a paper towel. Place the ham cut side down in the slow cooker. 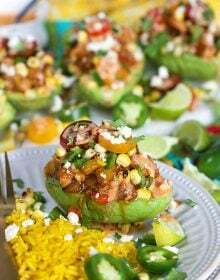 In a small bowl, whisk together the ingredients for the ham glaze. Pour the pineapple brown sugar ham glaze over the the ham and cover with the lid. Cook the ham on high for 3-4 hours or on low for 6-7 hours. 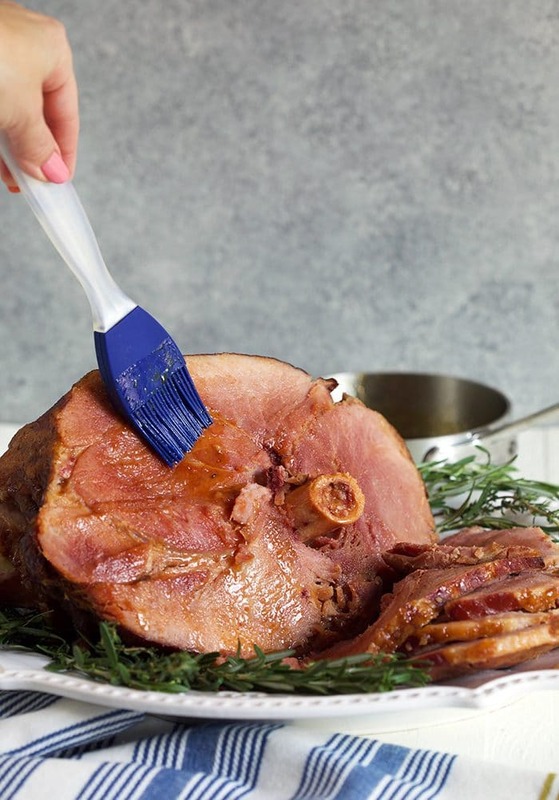 Check the internal temperature of your ham with an instant read thermometer, your ham is cooked when the internal temperature reaches 140 degrees F.
When the ham is done cooking, transfer to a platter and cover with foil. Allow to rest for 15-20 minutes. 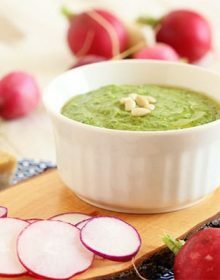 Transfer the glaze from the slow cooker to a small saucepan and bring to a boil. 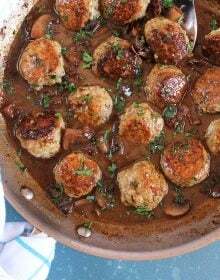 Cook the glaze for 10-15 minutes or until reduced by half and slightly thickened. 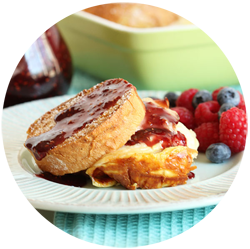 Brush the glaze over the surface of the ham and serve immediately. How do you make a ham glaze? 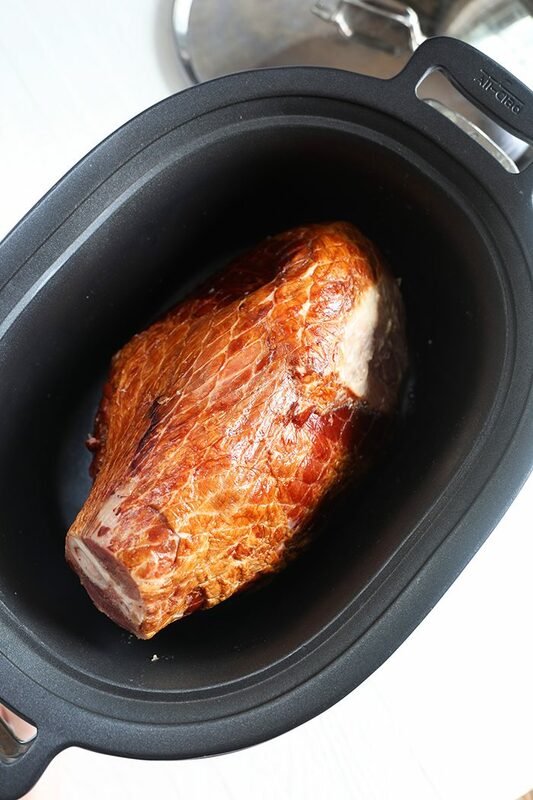 The ham glaze for this Slow Cooker Ham recipe is super simple to make. 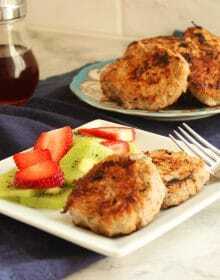 Simply whisk together the pineapple juice, brown sugar, mustard, cinnamon, allspice, ground cloves and nutmeg to combine. Pour the glaze over the ham before cooking. Once the ham is finished cooking, the resulting glaze will be thin in consistency. At this point, you can transfer to a saucepan and reduce on the stove or you can serve the glaze, as is. A general rule of thumb is you will need approximately 3/4 pounds of crock pot ham per person. However, I like to have leftovers for the next day so I like to make sure I have about a pound of ham per person….or more. It’s really up to you as to how much ham you want to be left with. And you can always send some home with guests. Who doesn’t like free food, right? The Very BEST Fried Cabbage….the BEST. Brown Butter Peas with Mint.…so simple. 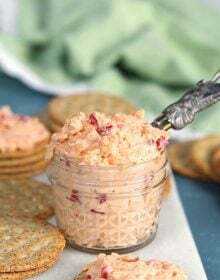 You can FREEZE leftover ham in an airtight container for up to 2 months or turn into some fabulous day two recipes beyond the usual ham sandwich. 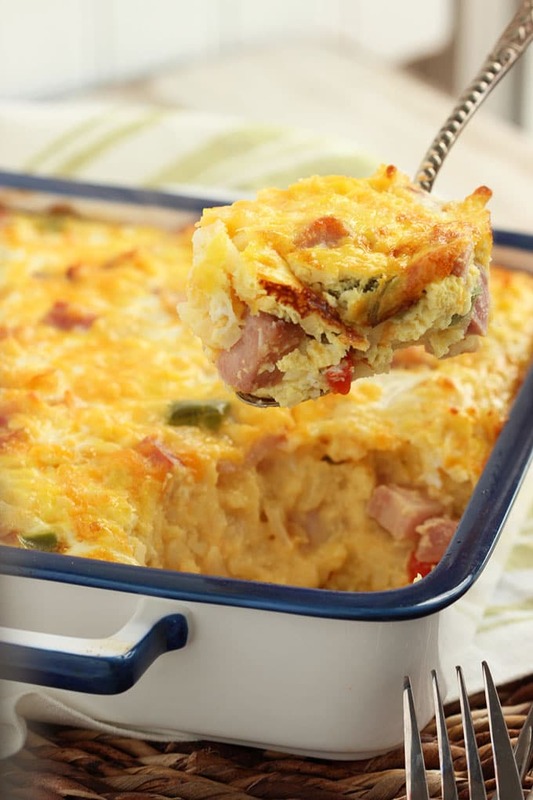 Ham Cheddar and Hash Brown Casserole…..so good and FREEZER FRIENDLY! 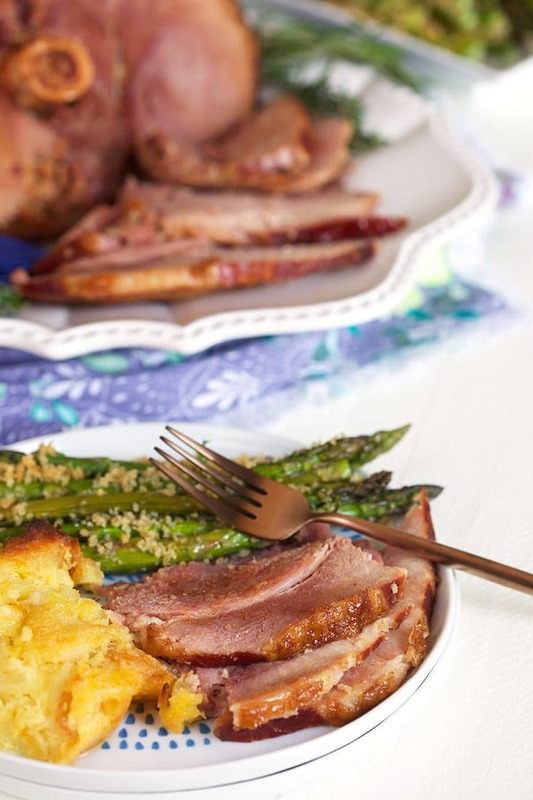 And if you’re looking for actual ham recipes that cook in the oven you should definitely try this Bourbon Honey Baked Ham….it’s so insanely easy to make and better than the commercially made Honey Baked Ham. Or you can make this Mango Ginger Glazed Ham that’s totally fab…..OR this Riesling Cranberry Glazed Spiral Ham…..sooooo good! 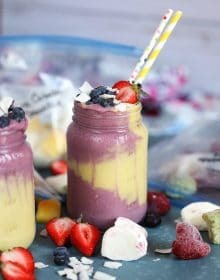 Want even more family friendly recipe inspiration? We have lots of fun stuff over on Instagram….go give us a follow! Super easy Crock Pot Ham recipe with a quick Pineapple Brown Sugar Glaze makes this the easiest ham to make for any occasion. Unwrap the ham and pat dry with a paper towel. Place the ham, cut side down, in the bottom of an 8 quart oval slow cooker. Pour the glaze over the ham and cover with the lid. Cook the ham on high for 3-4 hours or low for 6-7 hours until an instant read thermometer reads 140 degrees F.
Transfer the ham to a platter and cover with foil. Rest for 15 minutes. While the ham is resting, transfer the glaze from the slow cooker to a saucepan and bring to a boil over medium high heat. 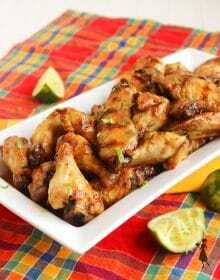 Cook the glaze for 10-15 minutes or until it has reduced by half and has thickened slightly.